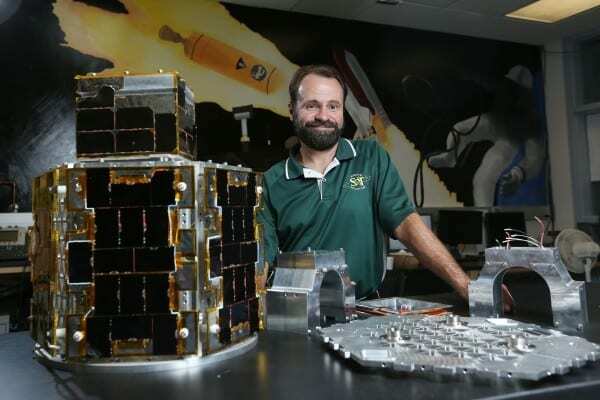 Professor Hank Pernicka and his team at Missouri S&T have developed a microsatellite imager in an Air Force contest and are working to produce the final version for delivery in 2017. A Missouri University of Science and Technology aerospace engineering professor is developing a microsatellite imager that could be used to check satellites, do small repairs or refuel spacecraft — and keep astronauts from making risky exploratory missions when something goes wrong. Dr. Hank Pernicka, associate professor of mechanical and aerospace engineering at Missouri S&T, and his students won the final round of an Air Force competition to develop the spacecraft. Dr. Kyle DeMars, assistant professor of mechanical and aerospace engineering, Dr. Joshua Rovey, associate professor of mechanical and aerospace engineering, and Dr. Jonathan Kimball, associate professor of electrical and computer engineering, also are working on the project at Missouri S&T. Pernicka and his team are working off their winning model and will build the spacecraft next year. Delivery to the Air Force is in the spring of 2017. And if all goes well, from there it’s launched to rendezvous with the International Space Station. The spacecraft is composed of two microsatellites, with MRS SAT docked to MR SAT during the launch to the space station. After a space station arm flicks the craft away from it, the first test begins. MR SAT will push away MRS SAT and use its 12 micro-thrusters to maintain a 10-meter distance between the two. If that’s successful, MR SAT then will begin to orbit MRS SAT, taking pictures of “her” with “his” two stereoscopic lenses. Made of machined aluminum, it weighs less than 100 pounds when fully assembled. Both parts are covered in solar panels to help run the electrical systems, and MR SAT has a fuel tank filled with R-134a propellant — basically the same as the coolant found in car air conditioners or the HVAC system in a home. The tank is about the size of a 2-liter bottle of soda, only slimmer. Heat shield tiles were damaged when Columbia lifted off, and upon re-entry those tiles failed, resulting in the space shuttle disintegrating and killing all seven astronauts on board. The microsatellite imager could have checked for damage, Pernicka says, before the shuttle began its trip home, giving NASA time to develop a repair plan. Beyond the human factor, Pernicka’s spacecraft has other applications that are of interest to the Air Force. “It could check on the status of spy satellites, fix components that have gone out of alignment on a spacecraft and check for debris,” he says.